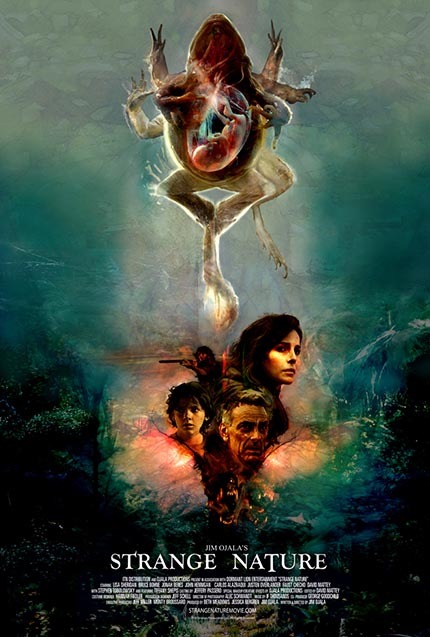 Strange Nature, the feature length debut of James Ojala, known primarily for his vfx work in film and television, opens in Los Angeles at Laemmle's Glendale Theatre on September 22nd. Billed as an eco-thriller Strange Nature is reportedly based on 'true unsolved outbreaks of wildlife mutations. It stars Lisa Sheridan (“Invasion”), Stephen Tobolowsky (Memento), John Hennigan (Minutes to Midnight), Tiffany Shepis (Victor Crowley), and Carlos Alazraqui (The Funhouse Massacre). Screen Anarchy has been given an exclusive clip to share with you below. We have also included the trailer and the long synopsis for futher context. A children’s hiking group in rural Minnesota discover several live, mutated frogs along a pond. In the same area, a single mother, Kim, and her 11-year-old son, Brody, have just moved in with her estranged father, Chuck. It’s not long before they too start witnessing strange occurrences including a disemboweled deer and the family dog’s deformed puppies. As the fear rises the rumors begin to fly. Some blame the intimidating disfigured hermit father and daughter who live on a surrounding lake. Environmental science points to the water sources. Possibly causes are pesticides, parasites or both. As the chaos spreads it becomes clear that Chuck’s cabin is a hotspot ground zero for these mutations. Trent, a grade school science teacher investigating the cases begins to fall for Kim while trying to protect her and Brody from whatever is coming next. Suddenly, a couple of teenagers go missing. Their mutilated bodies are found only a mile away. The attacks are so brutal it doesn’t seem humanly possible. Then another. Could it be a man or a beast? Finally, the unthinkable: the first human baby is born with similar horrid birth defects as the animals. Ultrasounds show an increasing number of abnormal fetuses with similar defects on the way. Upon delivery, the mothers start getting sick. Extremely sick. if there is anywhere safe. Strange Nature builds to an uncompromising climax of the terrors affecting a nice, quiet town and possibly future generations everywhere.